Colin Kaepernick, the quarterback who protested against racial injustice and police brutality by kneeling during the US national anthem, is the face of a new Nike advertising campaign. Kaepernick, 30, first protested by sitting during the national anthem in August 2016, later opting to kneel. Nike described him as "one of the most inspirational athletes of this generation". Gino Fisanotti, Nike's vice-president of brand for North America, told ESPN: "He has leveraged the power of sport to help move the world forward." 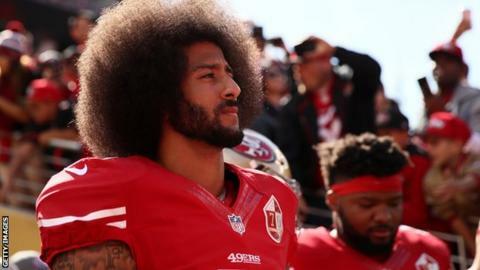 Kaepernick, who has received Amnesty International's highest honour, has been without a team since he opted out of his contract with the San Francisco 49ers in March 2017. He has filed a grievance against NFL team owners he claims conspired not to hire him because of his protests, and on Thursday it was ruled that case can go to trial. Nike's new advertising campaign, celebrating the 30th anniversary of its 'Just Do It' slogan, also includes ads featuring tennis star Serena Williams, New York Giants wide receiver Odell Beckham Jr and Seattle Seahawks rookie linebacker Shaquem Griffin.